Is it ok to use teak oil to preserve the "new" teak colour? If you own grade A teak garden furniture, the answer is absolutely NO. Although many people think that it is the very same oil that is naturally found in teak trees, it is not. It is usually solvent based in order to penetrate the wood and replace the lost oils. However, teak wood does not lose its oils and therefore does not need such treatment. Furthermore, treating grade A teak furniture with teak oil would do more damage than good because the solvents destroy the natural oils and make the wood dependent on oiling. Once you start oiling teak furniture, you must continue if you want your furniture to remain suitable for outdoor use. In addition, teak oil makes the wood susceptible to mildew and instead of preserving that distinct golden brown colour, it turns teak into a greasy orangey thing that does not resemble teak wood at all. Please keep in mind that grade A teak is very rare. There are not many retailers who sell the highest quality teak garden furniture despite the fact that most of them claim that they do. This and all the following answers to frequently asked questions are intended for people who own grade A teak garden furniture. Please confirm the grade of teak from which your furniture is made. You can use guides on our website. If teak oil is a bad idea, how can I preserve the original teak colour? We advise our customers against using any treatments for teak garden furniture because it only creates unnecessary work. After all, one of the main advantages of teak is the fact that it is virtually maintenance free. So why spend your precious time on maintaining your garden furniture if you do not have to? However, many people prefer the "new" teak colour over the aged one. Instead of using teak oil as suggested by some websites, we recommend a quality silicone based teak sealant. Like its name suggests, it contains silicon rather than solvents. It seals the pores of the wood and prevents the greying process by protecting the wood from the bleaching effect that is caused by exposure to sunlight. Our favourite is this teak sealant. It does not make the wood greasy and it does not leave that orangey colour like teak oil does. It does not have any effect on teak natural oil content and it does not harm the wood in any way. You can discontinue using teak sealant at any time and your furniture will simply change to that silvery grey colour. Please note that this advice is intended for people who own the highest quality garden furniture which is made from grade A teak and kiln dried to the optimal moisture content as discussed at our Buyer's Guide page. 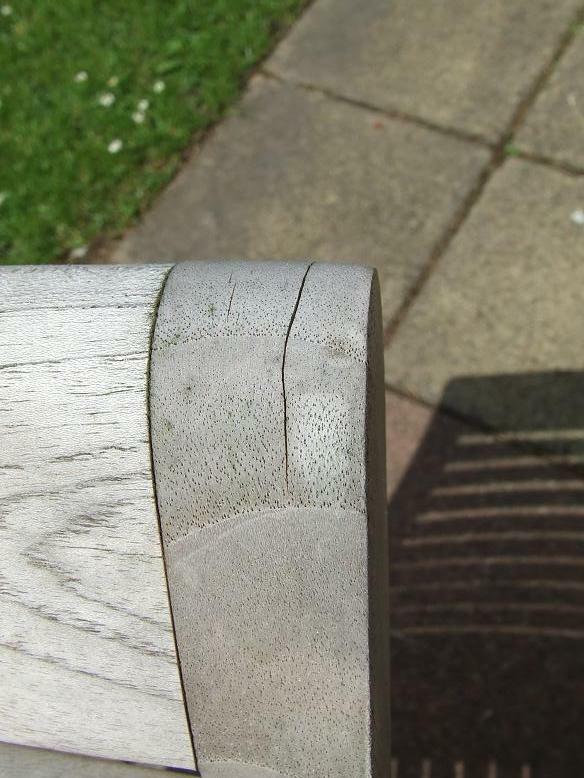 If your garden furniture is made from grade B or C, it is a good idea to periodically oil it in order to make it more resistant to moisture and rot. In contrary to grade A, lower grade teak has little or no protective oils and needs oiling to be suitable for outdoor use in the first place. Also, keep in mind that teak which is dried to more than 14% or unknown moisture content should not be sealed regardless of the grade. It would also seal in the water and increase the risk of cracking and warping when exposing the timber to direct sunlight as a result of stress. How can I get rid of checking on my garden furniture? Checking is completely normal for all types of wooden garden furniture including that made from teak. Some people do not mind some checking, however, the others prefer if there are not any. In you are in the latter group, you are recommended to wait at least three months for the furniture to settle down before sealing of the checking. After three months, teak garden furniture is considered settled and there should be no further checking. Now you can get rid of checking on your garden furniture. You will need: Exterior grade PVA glue and grade 180 sandpaper (used grade 120 sandpaper is ok as well). Apply the glue on the checked area. Wipe off excess glue. Ideally, it should remain only in the checking. Wait for the glue to start getting slightly tacky (about 15 seconds). Sand the affected area until the sanding powder does not penetrate the check and seal it of. Sand the timber in the direction of the grain. If your teak garden furniture already has a weathered look like this one in the photo, you will notice it returning to that distinct golden brown colour when sanding it. However, it will eventually be bleached by the sun and the repair will become invisible. How can I remove moss from my teak garden furniture? To clean moss from your teak garden furniture, you can use one of many specially made products. We have some available on our website. However, you can easily make just as effective solution yourself from a few common household items. We will show you how to make it but please keep in mind that it is bleach based. You are therefore recommended to follow the standard safety measures such as wearing gloves and protecting your eyes. Also, keep your children away and remove everything around the furniture that could be discoloured by the bleach. Mix the ingredients well in the bucket. Place the furniture to a safe place. The bleach solution can be harmful for plants and animals. Soak the furniture with the bleach solution thoroughly by using a cloth or towel. Leave the furniture covered with the solution about 5 minutes. Make sure that it does not dry earlier. If it begins to dry, reapply the solution (only where you notice signs of drying). Wash the solution down thoroughly with a hose. Leave the furniture to dry and inspect it for moss. If you still notice signs of moss, repeat the procedure but only on the affected areas. Crucial advice: Do not keep the solution on your furniture longer than 5 minutes! Do you have any other useful teak maintenance tips? Although the highest quality teak garden furniture is completely safe to leave outdoors during the winter as well, it is a good idea to cover it with a quality breathable garden furniture cover. It will make the spring garden furniture cleaning job a lot easier because it protects your furniture from dirt, moss and bird droppings. Also, use 3 in 1 oil for hinges and other moving mechanisms.